East Grampians Health Service recognises community and consumer participation contributes to the improvement of our Health Service. A better informed and involved community assists us to evaluate our services to improve quality and patient safety. A safe and quality health service results in better health outcomes for the community. Consumers are members of the public who have used, or might use the services at East Grampians Health Service in the future. Consumers include members of the general public, patients, clients, residents, family members and carers. What does a consumer do? Consumers provide information, opinion and advice to the health service about how we can make our services safer and better on behalf of the broader community. 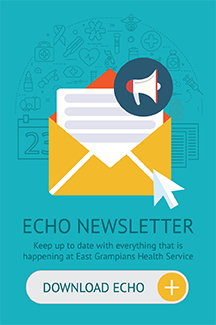 East Grampians Health Service is committed to providing quality care and service to our patients, residents, clients and visitors. To help us improve our service and assess whether we have met your expectations, we invite your comments. Your feedback is genuinely valued and appreciated. Feedback can be provided directly to the Chief Executive’s office on 5352 9300, via email at info@eghs.net.au, via the EGHS website, www.eghs.net.au or by completing a Compliments or Concerns form which are available in all areas of the health service. To provide feedback directly to the EGHS website, click here. Consumer Forums are informal small group sessions for feedback and discussion on your experiences at the health service. The forums focus on three key areas: What are we doing well? What could we do better? Were your needs met? For each forum an action plan is developed. Action plans are included on this webpage so our consumers can monitor our progress. EGHS regularly runs improvement activities and projects. These activities may include but are not limited to completing surveys, reviewing patient information brochures, hospital walk around activities and small project groups to plan and implement improvement activities. Consumers who would prefer an ongoing partnership role with the health service are able to apply for positions on our safety and quality committees. Community Consultative Committee – is a subcommittee of the EGHS Board. The role of the committee is to ensure effective community participation and volunteering across EGHS and to assist in monitoring the quality of services provided. Board Clinical Governance Committee – is a subcommittee of the EGHS Board. The role of the committee is to monitor the safety and quality of services provided. Audit and Risk Committee – is a subcommittee of the EGHS Board. The role of the committee is to oversee and advise the Board on matters of accountability and internal control affecting the operations of East Grampians Health Service. Capital Development Committee – is responsible to the EGHS Board. The role of the committee is to provide direction and support to project managers and related staff to successfully deliver EGHS Capital Projects. Harm Minimisation Groups – These committees aim to improve patient care and reduce identified clinical risks. Groups include Infection Control, Falls Prevention, Medication Safety, Deteriorating Patient and Wound Management. To everyone who has participated in consumer activities, we thank you for your valuable feedback and support. For further information about consumer activities at East Grampians Health Service please contact the Development and Improvement Department on 5352 9443.